Apple has announced a 128GB model of its iPad 4, doubling the storage capacity previously available. The company's senior VP of worldwide marketing Phil Schiller wasn't pulling any punches as he announced the new beefed-up tablet, taking the opportunity to have a dig at 'old PCs'. "It's clear that customers around the world love their iPads, and every day they are finding more great reasons to work, learn and play on their iPads rather than their old PCs," he snarked. Citing the increased storage capacity and over 300,000 iPad apps, Schiller made it clear that Apple intends this tablet for "enterprises, educators and artists". While the increased storage will appeal to home users wanting to carry more movies and music, it's the business market that Apple is gunning for. Companies using large amounts of data such as 3D CAD files, X-rays, film edits and music tracks would benefit from having more storage options. 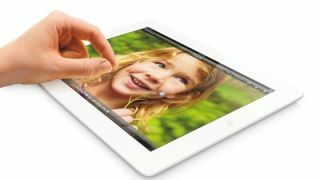 The 128GB iPad 4 release date is Tuesday 5 February, in black or white, for a suggested retail price of $799 (US), £639 (UK) for the iPad with Wi-Fi model and $929 (US) and £739 (UK) for the iPad with Wi-Fi + Cellular model. The new 128GB iPad 4 (or the new new new iPad, if you want to be pernickety about it) popped up in an iOS 6.1 beta build just yesterday. The official announcement came as Microsoft unveiled its old-PCs-friendly Office 2013 packages which, if we were a cynical bunch, we might posit Apple had done to rain all over the Redmond company's parade. But then, that's not like Apple, is it?